FIRENZE 4 EVERAgain, sorry for the absence guys. As I explaind in my previous post I got sick right after Christmas and spent some days off during Christmas/New Year’s Eve holidays with my family. And I can tell you, it felt so so good. I craved a cozy moment in my bed and got it, and now I can totally feel fuels of energy running through my body! Thumbs up for people who love lazy sundays as much I do. Right after the holiday break James and I got invited by Luisa Via Roma, one of the best online luxury boutique, to meet them in Florence during their Firenze4Ever event. The goal was to enjoy a cool moment with some great bloggers as well as take part in their Style Lab. More details to come in the following days or on instagram where I already posted some Style Lab shots (@kristina_bazan). We arrived a couple of days ago and both James and I weren’t only fascinated by the beauty of Florence but also by the beyond-breathtaking hotel we got to stay in. Villa Cora has this strange old baroque atmosphere but at the same type transports you in a completely different world. Quite cool actually. And the architecture is simply stunning, a mix of high luxury with modern details and special light systems. We couldn’t wait to shoot some pictures and took advantage of the amazing park in front of the hotel for this article. have a blast!! great pants btw! I LOVE Florence, it's such a beautiful city! You look gorgeous very chic! I've seen a lot of pictures of this hotel (also on Instagram) and it looks like a dream come true! I absolutely love your outfit! The pants and boots are fantastic. And what a great place Villa Cora is! so in love with the style of your hat! You look amazing ! Love the coat ! Wow beautiful place & photos :). I love the leopard print in the other colors ! the background it's perfect ! Gorgeous Kristina - good job, both of you! I can't wait to see more pictures - perhaps from inside the "Villa"? Anyway I wish you the best - I hope you enjoy your stay there! Lovely outfit, hats really suit you, well, everything does! I love your pants, I got some similar too! Those pants look so cool. Great shots! Love this look, your pants and boots are amazing, enjoy your stay in Italy. You are so so stunning and beautiful! I am so glad that you are successful from these beautiful pictures! Florence looks beautiful, I would love to visit there one day! Your outfit it just perfect as always! Love the print of the trousers! I am sorry to hear you have been ill, I hope you feel better soon so that you can post more things that I can enjoy and read! Have a great time! How pretty are you & so is the background! I love your outfit ! Coat, hat and boots- perfect! very beautiful pics!!! you look amazing! Your coat looks so warm and cozy! So classic, great work with the necklace! Wonderful outfit !!! Awsome necklace and hat ! Great Pictures I love the Bag and the Shoes ! Which I've bought that coat! I adore it! gorgeous coat and gorgeous location! So fabulous! Have fun in Florence! Oh wow, beautiful! Love everything about your look and the place you are staying looks amazing! Cannot wait to see more photos! 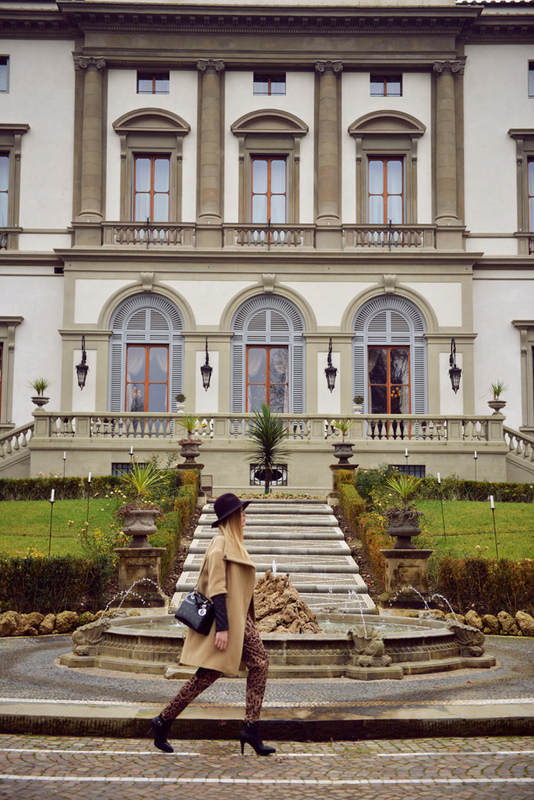 So lucky to travel to such wonderful places, you look amazing as always, that Zara coat will always inspire me! Woow tu les fais pire bien tes bijoux *-* Je suis bleufée !! Gorgeous outfit, you look so pretty! So gorgeous, I love your hat! Florence is one of my favorite cities... hope you enjoy! You look gorgeous! Love your hat and shoes! Hope you had a great time! You look stunning! That's such a lovely coat! Amazing photos as always. Love love love LOVE it! So pretty! Such a great location for photos, can't wait to see the shoot you did inside. Est-ce que vous retouchez vos photos ou est-ce que ce sont les couleurs naturelles? :O Vraiment, c'est somptueux! Ah so beautiful! Quite jealous of your hair! This outfit rocks , espacially the hat and coat ! This place is amazing! You're so beautiful! Amazing photos! And I just love your booties. Wow! You're so incredibly beautiful! OMG gorgeous jacket i love it so much!